Aaron Kauffmann and Dr. Stan Grove remove a polypropylene mat that is used to harvest the algae grown in a photobioreactor. The glowing green tanks on the second floor of the Goshen College Science Hall look like something from a sci-fi movie. It seems fitting, as the clear plastic tanks, called photobioreactors, could be the future of how we produce biofuel. The three tanks, each with large florescent lights strapped to the outside to encourage photosynthesis, are alive with 185 gallons of green algae-filled water. The project, known as AlgaeTown, was conceptualized four years ago by Stan Grove, professor emeritus of biology, and Dave Slagel, the CEO of Formco Inc. in Elkhart, Ind. It was an effort to find an easy and efficient way to produce algae, which can be harvested for use in biofuels, pharmaceuticals and even food. For years, algae has been rumored to be the fix for many of our global energy problems. The problem is that no one has been able to effectively grow and harvest a large enough biomass of algae for it to compete with other crops. “The challenge is to get the algae out of the water efficiently, and so far nobody knows the best way to do that,” Grove said. Companies and universities have tried filters and centrifuges, but these often require more energy to operate than the algae produces. But the AlgaeTown team believes they are getting closer to a solution. The algae is harvested by hand by carefully removing a collection of polypropylene mats that the algae adheres to. This method consumes no energy and has resulted in harvests that are 30 times more concentrated than the algae circulating in the tanks. 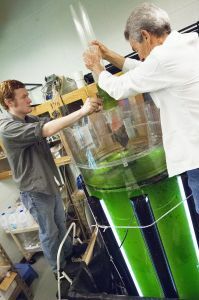 The team believes that this method could alleviate one of the major hurdles to profitable commercial algae production. 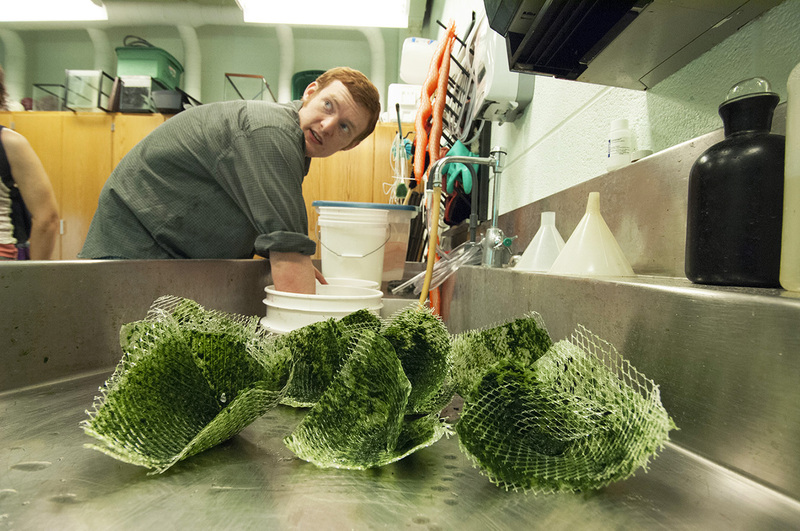 View photos of algae being grown and harvested. Another problem is funding. Up until now, the Goshen College science department and Formco, Inc. have supported the project financially. Now, as they’ve met some success, the team is looking for more funding to help with the increasing costs of testing and development. They have applied for grants, but they are also turning to the public for support. A crowd-based funding contest in Popular Science Magazine earlier this year got the attention of Aaron Kauffmann, a senior molecular biology/biochemistry major from Goshen. With the help of Natasha Weisenbeck, a senior public relations major from Clifton, Ill., and the rest of the AlgaeTown team, they submitted their proposal to raise money through crowdfunding. Crowdfunding is a way of building support and raising money online, in which a large number of people donate small amounts of money to a project. Artists, musicians and entreprenuers have been raising money and awareness on crowdfunding sites such as Kickstarter, Indiegogo and RocketHub for more than a decade. They weren’t among the 24 finalists, but that didn’t discourage the team. With a plan already in place, they launched a month-long campaign to raise $18,700. During the month of September, the team plans to reach out to the local community through events and social media. There will be AlgaeTown events at the Goshen Farmer’s Market, open houses to view the lab and even an “algae drink” at Java Junction, the college’s coffee shop. They will also give away gifts to people who donate through RocketHub. The gifts include buttons, bumper stickers, t-shirts and even dried algae samples. Investors who donate $10,000 or more will even receive their own photobioreactor tank, which they refer to as a vertical lawn. Visit the AlgaeTown Rockethub page. The money that is raised will go toward equipment, supplies and student work-study time. The hope is that with more dedicated equipment and students able to work on this project, the AlgaeTown team will come up with a commercially viable process for growing and harvesting algae. From there, the possibilities flourish. 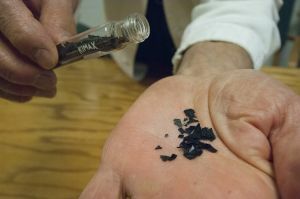 Dried algae can be used in the production of biofuels, pharmaceuticals and other applications. Once harvested, algae can be dried and sent to companies who extract products, including oil, that they can turn into fuel that burns cleaner and more efficiently than petroleum products. Current biofuels, such as ethanol, are made from corn and other crops. With algae, it’s the same idea as growing corn or soybeans, except that growing algae consumes fewer resources and less energy while producing much higher yields compared to field crops do. Studies show that some strains of algae can convert up to 60 percent of their biomass into oil, while that number is less than 10 percent for corn. For more information on the project or to donate, visit AlgaeTown’s RocketHub page or find them on Facebook. Algae can be used to make bioethanol, biodiesel and biobutanol. Algae has the potential to produce vastly superior amounts of vegetable oil compared to field crops. Algae contains an abundance of vitamins and minerals. Algae helps regulate blood sugar and digestion. Wastewater treatment plants use algae to reduce their use of harsh chemicals. Algae can be used to capture fertilizer runoff from farms. Algae consumes carbon dioxide. Mass producing algae has the potential to drastically reduce CO2 emissions. • 300,000 – 1 million: estimated number of species of algae worldwide. • 10,000 gallons: amount of biodiesel that one acre of algae might produce. • 140 billion gallons: amount of algae biodiesel that experts estimate it will take to replace petroleum-based products in the U.S. each year. • 95 million acres: land needed to produce enough algae biodiesel to replace petroleum-based products in the U.S., compared to billions of acres for other biodiesel products. • 700 liters: amount of water in one photobioreactor at Goshen College. • 10-20 micrometers: diameter of the algae cells that AlgaeTown harvests.